Is it Okay to Display Student Testing Data in Classrooms? In some of the elementary schools in the district I work in, teachers are strongly encouraged to display the results of student tests (such as reading fluency or interim "benchmark" assessments) in the classroom. Each child's score is identified -- a name next to a number, visible to all students, parents, and staff. I'm not intending to engage in a massive debate around standardized testing in this post, (I recognize that the practice I'm critiquing is a result of testing-madness) but I am questioning the making-public of personal data especially for very young children. In one school I visited a second grade teacher hung her data poster on the outside of the classroom door. Perhaps because I am a mother, I often imagined being the parent of one of the students whose name was at the bottom, in the red zone. What would it feel like to bring my child to this door everyday? And what would it feel like (this I could barely imagine; it made me feel sick) to be one of those seven-year-old children on the bottom, to see my name there each morning as I arrived at school? I have talked about this with other teachers and principals. They claim that the shame is not where the child is, but that our society, our education system allows them to be there. Posting the data only makes public what was once unseen. They argue that the data is displayed so that we -- educators, parents, and children -- will be motivated to work harder and so that we will be inspired throughout the year as the scores increase. "It's about taking collective responsibility for our kids and seeing the growth," boast the champions of this practice. Even if children are making progress during the year, I do not understand the need to publically identify each child and her score. Why cultivate a classroom climate so focused on test score growth? And for those in the lowest bands, in the red and orange, could the shame and humiliation really be motivating? I am aware that all of us who work with and in schools have to deal with the standardized testing demands and their demons, but why not protect our kids as much as possible from this mania? We should draw the line at posting children's names in classrooms next to designation such as far below basic. I would never allow my son to be in a classroom where this was happening. I do believe that data can be publically displayed in a way that respects every child wherever he or she is at, and which could be used to motivate students. For example, I have seen data charts in classrooms showing the percentage of a class that has mastered a particular standard; this score is updated as assessments are delivered throughout the year. I have also seen individual student data displayed according to the percentage of growth made -- "Raquel: 75 percent increase in words per minute!" I think I'm okay with that. Recognizing students for demonstrating school values. But data displays should not be limited to reading fluency or math mastery. Students' other skills and talents should also be acknowledged publicly. 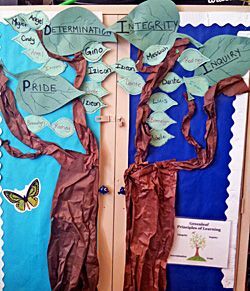 I have seen charts recognizing children who demonstrate a school's values such as "Persevering" and "Demonstrating Integrity." I have seen charts recognizing students who excelled at artistic or physical education skills or who didn't miss a day of school in one month or who were kind to their kindergarten buddies. What if students were encouraged to set goals -- academic, social, or emotional -- and what if they charted their progress on those goals and selected what kind of information they wanted to have displayed? What if we only displayed data that reflected a child's success? There is plenty of research demonstrating that what we focus on grows. Let's allow our students some say in what kind of data they share, let's focus on their successes and paint our doors with that good news. That's a classroom I'd want to walk into. What do you think about this issue? How do you display student data in your classrooms?